Lynne Davies would like to thank the people who have contributed to this page and everyone else who has given feedback in the past. Comments, positive and negative, enable Lynne Davies Dog Training to continually improve their services ensuring they maintain their position as the best dog training school around. 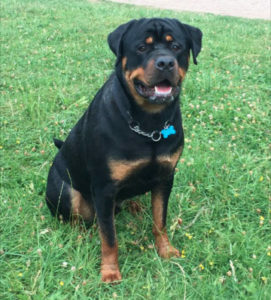 I have owned Bungle from 7 weeks old, I have had a few Rottweiler’s before but none had been quite as stubborn and sensitive as Bungle. As he was getting older he became protective of the tackroom at my stables and he didn’t really like strange people or dogs he didn’t know. I had a couple of dog trainers out to see him but nothing really changed other than his behaviour was getting worse. I knew I needed to do something before I either had to rehome him or worse, so I called Lynne. She came to see him, we had a two hour session and she showed me lots of things to do with him and how to teach him to behave with people and dogs. Within days I had a different dog for the better, he is a much happier dog and has been for walks off the lead meeting lots of new people and dogs. I can’t believe the change in him in such a short space of time. I have had so much support from lynne which is brilliant, without her I don’t know what would have happened. I would recommend Lynne Davies training to everyone, she has changed Bungle’s life forever. 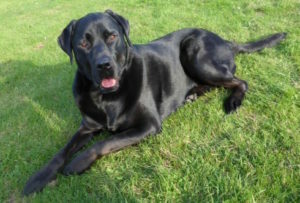 Hamish our 8 year old Labrador X developed issues towards other dogs over a 2-3 year period. He would lunge, growl, bark and generally react very badly, to the point that I stopped taking him out as I had lost my confidence with him. 4 hours with Lynne and what a transformation! I never thought it was possible, but I can now walk Hamish on his lead through a crowded high street, across a busy beach or, as we did recently, around a large dog show and he was so well behaved. We both enjoy our walks now and go out of our way to find places that are busy with other dogs to continue our training. Massive thanks to Lynne for providing me with the techniques and confidence to work with Hamish and for the ongoing support she provides. Maple had puppies in January and we decided to keep one, we named him Finley. As Finley grew older Maple became protective of him and suddenly became aggressive to other dogs. Finley started to copy this and suddenly we had two dogs who were growling and barking at other dogs. This made walking them a nightmare and we would avoid all other dogs. We brought them to Lynne after seeing her advert in “Dog” Magazine. We did 4 hours intensive training with them and Lynne showed us techniques to stop the dogs reacting to other dogs and new people. We now enjoy walking them and look forward to meeting other dogs and strangers as both Maple and Finley now just walk by and don’t react to them. Maple and Finley are now like different dogs and my confidence has grown. This is all down to Lynne’s expertise and we are so pleased that all her great advice worked like a dream. 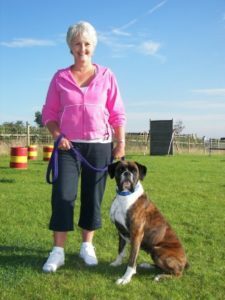 Misty came to us in January 07, she is a Boxer with a great personality and a mind of her own. A wonderful dog indoors but get her outside she changes completely, she used to be up for trouble with other dogs and even growling and whining at people too. I dreaded taking her out, in fact, I wouldn’t go out without my husband because I couldn’t hold or control her. I first heard of Lynne from a friend, I arranged a home visit, and to cut a long story short, Misty and I have come on in leaps and bounds since that day, with good sound and sensible advice. We now train off lead in a group class surrounded by other dogs. My confidence has grown and Misty is a changed dog. Thanks to Lynne’s expertise I really am enjoying being Misty’s owner and she also has confidence in me. When we introduced Breeze to our household, Scooby became more aggressive towards other dogs in close proximity to his new sister. We needed help. Initially we contacted Lynne to come and have a home visit which really opened our eyes about canine behaviour and managing dogs in our home. We learnt more in an hour with Lynne than all the time we had spent researching dog training and behaviour of Ridgebacks! It was worth every penny and we thoroughly recommend this to anyone, experienced or not. 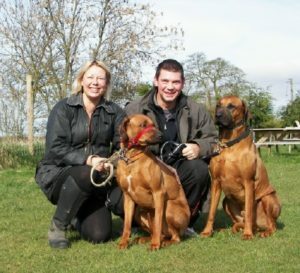 We now have two very happy, obedient Ridgebacks who are a pleasure to us both. 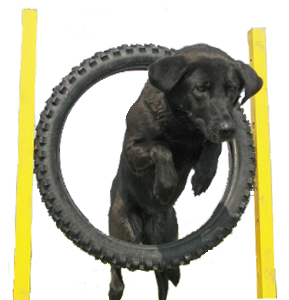 We attend regular training classes, keeping our dogs focused and well behaved as well as trying new activities such as agility, new commands and socialising with other dogs. Now, it’s a nice feeling when people stop us in the street and comment on how well behaved our dogs are. When we arrived home from the course Bliss came through the door and it was 3 hours later when she moved for the first time! As you predicted, she was shattered! 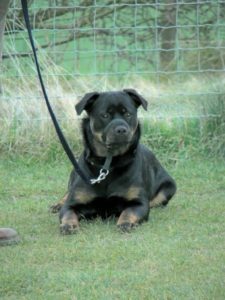 Previous training we have undertaken – whether with Bliss or our previous dogs – by comparison with your course has addressed only part of the dog’s needs. We came away shattered too, but also delighted with what you have helped us achieve. The standard of training we expected to be high, but it exceeded our expectations. With dogs (and perhaps more relevantly – people) at different standards with different needs you somehow dealt with all of us and the talks were great. I am just home from my training class and I feel so disappointed I could of walked out. The difference between the residential course last week and where I have been tonight just cannot be described. Chips came to us from the Blue Cross as a 4 year old stray. He was deemed a “special case” due to his odd behaviour with other dogs. 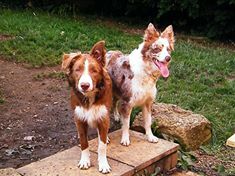 Once home, it quickly became clear that not only were other dogs a big problem, but also anything else with 4 legs – walking in our local fields with sheep and cattle was a real problem as Chips would fixate and freeze, even from quite a distance. Within days we realised we needed help: we contacted Lynne, who did an assessment in our home and then a follow up at the training centre to witness his behaviour with other dogs. From there we enrolled onto weekly classes and slowly but surely, Chips’ behaviour has been transformed. Chips is now obedient in class whilst surrounded by other dogs. He is happy to walk through sheep and cattle without fuss. We are hugely indebted to Lynne for her inspiration and giving us the confidence and expert knowledge to work with Chips; also to our trainers Lorraine and Linda for their help and patience. Our dog Kosci, the Polish Tatra Mountain Sheepdog, had attitude problems that were becoming worse. He took us for walks, barked at anything and everything and would lunge at and bark in the faces of members of the public. We knew he was guarding us, however 52 kilos of aggressive dog was pretty scary to people walking along the country lanes in Switzerland. 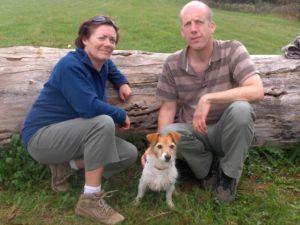 Lynne flew out to visit us and spent a couple of days showing us how to take control and how our relationship with our dog influenced his behaviour. She also showed us techniques to enable us to control him on the lead without having to use physical force, a battle that we could not win. 24 hours later, and Kosci is a new dog. He no longer jumps up at anyone. He doesn’t growl, bark, or lunge at people any more. Walking him is also a pleasure as he now walks on a loose lead beside us. We remain truly amazed that the change has been so dramatic. 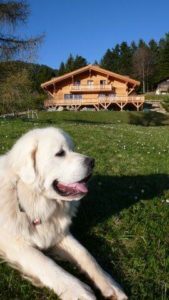 Lynne Davies had an appreciative audience here in Villars during the training and we expect her back in the very near future to help set up the V.L.D.P.D.C (The Villars Lynne Davies Problem Dog Club).